I already had a coughing fit and figured out who is against the big Rosia Montana project. But who exactly is for it? I can’t reveal any of their names but there’s definitely a lot of money behind it. They are now literally buying entire chunks of three of Romania’s 24-hour news channels. They’re also paying for fake “documentaries” that all have 1950s sounding names like Gee Whiz Mining Sure is Sweet or Wowzers Mining is so Cool and the like. Not much I can do against their video propaganda but I thought I’d have a peep at their official website that’s running ads literally everywhere (assuming you’re ISP shows you’re in Romania) on the internet. It’s called Da, Rosia Montana which literally of course means “Yes Rosia Montana” but if you tilt up your voice at the end of the statement it sounds like you’re asking, “Yes, Rosia Montana?” like WTF do you want this time? Sorry but I think it’s funny. Here’s the original top half of their website. As always, click on the image to see it full-size. 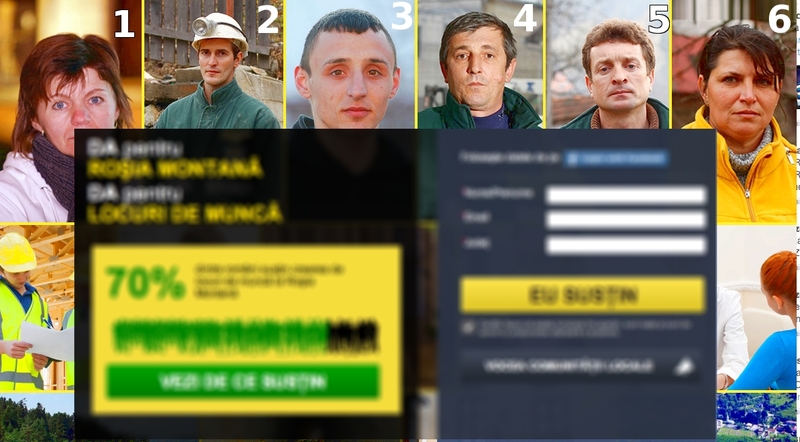 If you don’t speak Romanian it says that “70% of Romanians support the creation of jobs from Rosia Montana” and the big green button says “see why they support it”. At this point I had to laugh. To show you why, I slightly tweaked this, de-emphasizing the words and bringing up the faces. I swear this is the real ad! Do any of those people look like they are happy about anything? Frankly number 4 looks surprised and number 5 looks lost and confused. Do you love it? If you like, in the comments you can tell me what expressions you think the people have. 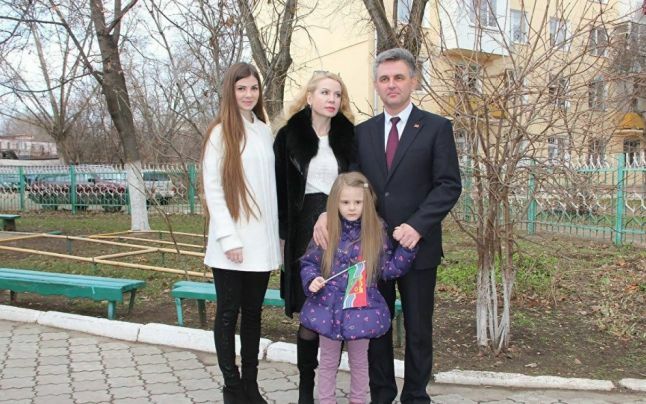 Which then goes on to tell you the 70% of Romanians who support Rosia Montana actually means 71% of people who live in mining communities in the area of Rosia Montana. So it’s not 70% of all Romanians, only those who live in mining communities. Which makes me wonder why not the other 30%? I’m very curious where the money for all of this is coming from exactly but it has the clear marks of bungling that means a lot of Romanians are involved. Obviously they are outclassed by the “anti” Rosia Montana organization which every single weekend is putting thousands of bodies on the street. I just wonder which politician is going to go down in a hail of warrants from the DNA in the near future for all this insanity. Almost $100 million has been spent by Gabriel Resources as reported in its quarterly financial reports (on-line) on ‘external communications’ ($60M) and ‘legal’ ($25M) during the past five years; and ‘consultants’ ($20M in stock options in 2011 alone). This goes a long way to explaining the leverage in affecting political opinions. Funding comes from Beny Steinmetz (under investigation by the FBI in the US for other matters), Thomas Kaplan,and John Paulson all leading billionaire ‘gold’ investors plus Newmont Mining, America’s largest gold mining company. And isn’t that miserable looking woman labelled ‘1’ the person who knits socks for a living? http://www.youtube.com/watch?v=Z-HCjgqEDuI Ah yes, exactly, Rocky’s Dad. Sanda Lungu!! Boy, was that an unforgettable interview. Such a charming woman. Number 1 – the (in)famous Sanda Lungu has the expression of an owl-fucker, as she herself has declared in public (watch this: http://youtu.be/iSPYyiuM5C8). Number 3 has the expression of just a stupid guy. Plain stupid. A vacant expression, that’s what I see…they don’t know why the hell they are doing on this site! I’m Romanian living in the States. I understand you’re in the opposite situation :) All this Rosia Montana stuff makes me sad… and mad although I haven’t even seen my country in a while. First off there is a need for awareness in Romania (and not just Romania). People need to know what’s going on… the truth that is, not this BS they show on TV. After that they can judge for themselves. I’m sure a lot of people will still think this project is a good idea, but hopefully even more will oppose it. And second, for those who already know the truth and think this is the worst think happening in the world (slight exaggeration), they need to understand that horrible thinks take place all over the world. It is not about the Romanian government, it is about bigger powers and people. The EU and others decide things. I wonder if Romanian people would rather have a country where the food is being poisoned, genetically modified, the water is poisoned with fluoride, the air is poisoned and I will stop here.